Are you looking for an exciting opportunity to join a fun team and see the city every day from a bird’s eye view? This job is action packed, and we provide all training and equipment to start your career in the outdoor advertising industry. Porter Advertising LLC has been serving Eastern Indiana and Western Ohio since 1945 by providing results-oriented marketing solutions in outdoor advertising. The ideal applicant is prepared to climb up to 30 feet to perform installations and billboard maintenance. 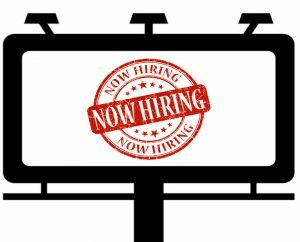 Applicant will also assist with upkeep of billboard sites, including lawn mowing, painting, and construction. This is a great job for someone who enjoys variety in their day and being outside of 4 walls. Porter provides company vehicles – a valid drivers licence is required. Techs work year around and an average of 45 hours per week. Paid vacation, medical insurance, and 401(k) is included. Hourly wages begin at $13 an hour and will be based on experience. Like what you’ve heard so far? Fill out this form and a representative will be in contact within 48 hours. This position is no longer accepting applications. Check back for new openings!